My 'love-affair' with ink continues. I adore the stuff. I like everything about it. I like the simplicity, I like the contrast of black ink on white paper and I am intrigued by the endless possibilities that ink offers. Even the word 'ink' gets me excited and when I'm not drawing, my head is telling me I should be. Yes, you've guessed it, I'm an ink-addict. This takes me back to my schooldays, when I loved drawing with ink. I would sit for hours copying characters from comic books and I couldn't wait for art class to begin. All that ended with the arrival of a new teacher, who did not appreciate my style, which was quite similar to today's zentangle. We clashed a few times and it became so intense that I dropped out of art class. I didn't stop drawing though. I was the kid who drew designs on the other kids denim jackets. It made me quite popular, and earned me a few quid for the weekend, too. But through time, family life, work and other pressures meant I had to stop. That's history now and I don't like to dwell on the past. We can't change what happened yesterday - better to move forward with a new outlook. On Monday, I opened a new A5 sketchbook with the idea in mind that I would keep it solely for black and white ink drawings. On Wednesday, my daughter asked me if she could borrow my sketchbook to try and copy some of my designs. She went to her room clutching my sketchbook and a handful of pens. When she came back my black and white drawing looked like this. Ah, well, so much for my new black and white sketchbook. As I said earlier - it's history. Happy PPF, and have a great weekend. In a late amendment to this post I have decided to add the #Inkotober , #Inktober 2017 to the labels. I have started this challenge late, I probably won't be able to post every day and I might not follow the official #Inktober list of prompts because I have my own very definite ideas about what I like to draw, but that should be OK going by what I've read. Hi, Valerie. Thank you for your kind words. I prefer the black version, but I like the coloured one as well. Some of the design is quite intricate, so it probably was a challenge. *wow* is that beautiful the sketchBook! the paint is in one and it is such a wonderful no matter what you paint or design. To do it again, just like you must be gorgeous now for you! Who is not addicted * winker * I believe everyone who let go inside and leave it can never be painted. only if it is forbidden or something else can prevent but in the heart and the soul it remains. sory my english comes from google translator i hope you can understand it! Hi, Elke. Thank you for commenting. It's great to be drawing again. I think once you start any creative endeavor it's hard not to become addicted. Well there is a gift in that stunning teamwork....you need to create a black and white colouring book for people like your daughter! She is brilliant and so are you! 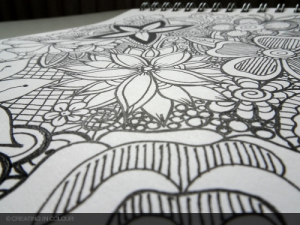 I loved that kind of zentangle art when I was young...still do! Great story too! My daughter quit art because a terrible teacher gave her a nasty mark when shed always done well. Teacher said her clay work was disperportionate. At the time boys were wearing saggy pants down their butts and it was a perfect depiction from behind. I still love that little statue.Teachers can be so damaging to a child's spirit!Great post! Hi, Giggles. Thank you. Your kind words flatter me, but my daughter is brilliant. It's hard to keep going after receiving harsh or meaningless criticism. Constructive criticism is good, but so many people just criticize because they are jealous or don't understand. That gets very frustrating and causes heartache. Adults should have more sense, but unfortunately lots don't. Hi, sirkkis. Thank you for commenting. Very much appreciated. The colouring is good. She's improving quickly. The more I draw, the more she colours and tries to copy my drawings. Hi John, I was sad to read about that teacher's shameful attitude to your art. Thank you, Sue, for commenting. Some teachers just don't get it; they should but they don't. Glad you like my drawing and the colouring. Thank you, Susan, for your kind comment. I tend to stick to a couple of different type of pens, either Staedtler pigment liners or Uni Pins. I am going to write a post about the different pens I use in the near future. wow- both versions are simply amazing!! A gorgeous collaboration between father and daughter. Happy PPF! Thank you so much, Linda, for visiting and commenting. Very much appreciated. We do work well together, most of the time. Thank you, Colorful World. Your comment is very much appreciated. I can't decide which I like more, your black and white or color. They are both so striking for different reasons! Happy PPF! Thank you, BrownPaperBunny, for your kind comment. I reckon they are both good in different ways. Hi, Sandee Setliff. Thank you for commenting. I love the coloured version, too. But I just feel that black and white makes a very striking image. Thank you, Clare. Very much appreciated. Beautiful ink work, and great that you allowed your daughter to express her creativity too! Thank you, Christine, for commenting. I think it's great when kids express themselves through art. I love both versions, but surprisingly I think the b/w one edges ahead (I am a colour junkie!). Thank you, Sharon, for commenting. I love colour too, but I think there is something quite striking about a b/w image. So you joined the ranks in the end anyway :D Good to have you along for the Inktober ride. I was going to say that you don't need to post everyday, I know I certainly can't, work will see to that as I crawl in on a Friday night completely exhausted with no inclination at all to pick up a pen. Regarding the coloured in artwork - I'm afraid this Mum would have been happy to see creativity and would have done her best to complement daughter, but would secretly be screaming in my head 'You touched my stuff, my art, no touch the art!' This would be followed by a gentle lecture about not touching Mum's stuff. But then I'm a control freak :D I've made sure and clear with my kids that they have their art supplies and I have mine and Mummy doesn't share well. Don't touch the art :D But then I obviously have issues :D Yay for you being a great Dad and not freaking out like I would have. Hi, Liz. Thank you for taking the time to comment. In the end I couldn't resist taking part in Inktober. Challenges are good and it can be rewarding to push yourself to see how much you can actually do. I'll just have to see how it goes. As for the colouring in, it doesn't bother me if my daughter mucks around with my art stuff. I'm quite laid back, and art is for sharing. So you did join!? Good on you! I don't follow the prompts either, although I get the feeling a lot of people are. 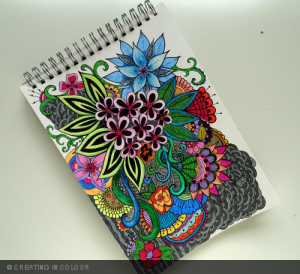 I love your zentangle flowers, your version as well as your daughter's version. Funny to hear that you had that same style in your school days already, and booo to the teacher who couldn't appreciate it. Just keep doing your thing, you're very good at it! Thank you, denthe, for taking the time to comment. I thought I might as well join in, even if I don't post every day; I'll do my best to though. Lots of my sketchbooks from back in the day are filled with this kind of thing. I thoroughly enjoy this style and now that I've started again I have no intention of stopping. John, you are truly a master at this. I am just taken back at the detail and then the depth of your art. BTW you daughter did a great job of adding color. Wow! Thank you, Nicole, for your kind words; you flatter me. But I'm glad you like it. My daughter's artistic skills are improving rapidly. I am an ink addict also. I loved drawing with pen at school and now it seems I am into it again. 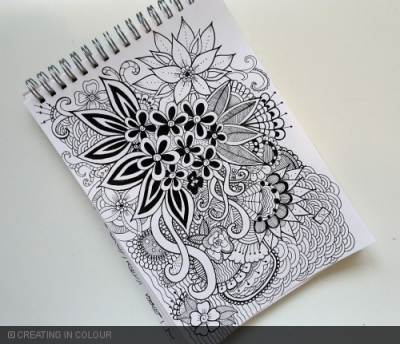 I love your black and white doodle...and I also love your daughter's colour version. Hi, June. Thank you for your comment. Nice to know there are a few other folk similarly affected by ink.